Blast your offers through all possible channels, while keeping an eye on a SINGLE calendar. 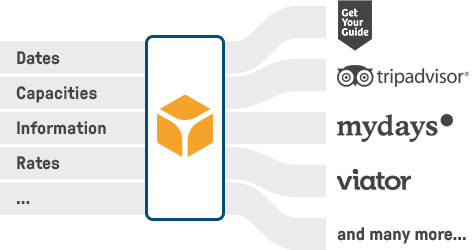 Bookingkit links and synchronizes all portals, giving you control over all important details. With bookingkit, you receive real-time information on capacity, dates and prices thanks to our intelligent channel management tool. Bookingkit will help you with overcoming market-related obstacles, so you can grow your business with ease. Thanks to bookingkit, information on availability, time and price are automatically adjusted. We continuously synchronise your reservations, product information and other details in the background. Soon you can lean back, because you won’t have to worry about anything else! 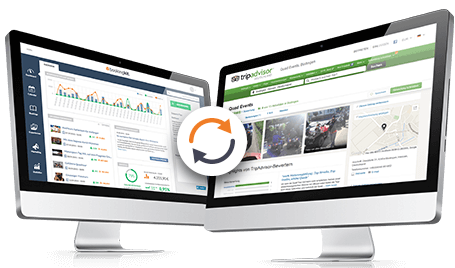 Increased revenue, better overview and more time for you! bookingkit is the most versatile solution for your business. It’s easy to install and lets you start immediately! Try bookingkit for free! Start today – We offer a 7-day trial without any commitment. Forget about overbooking and analogic calendars! Reservations made through associated distribution channels such as TripAdvisor, Mydays, GetYourGuide etc. automatically end up in bookingkit – and the availability on any other platforms including your website is automatically updated as well! This means that all dates are in one calendar, while a single system updates and combines the data of all used platforms in one place – you only have to login once in order to get the overall picture. You don’t need to do anything else: bookingkit automatically takes care of transmitting forms, specifications and other meta data. You decide, which distribution channels are best for promoting your offers: Should they be exclusively available on your website or do you want other partners and platforms attract more customers for you? You make the important decisions when it comes to promoting your services and managing their availability. 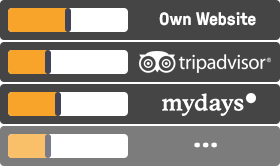 Even better: With bookingkit, you can control every offer separately. Booking has never been so easy! Complete administrative tasks in a heartbeat and get ongoing online reservations. Incredible and safe! Trust the solution that is considered the best in test. Try it now for free! Globally unique function to preview and optimize your capacity. Take a look at your company’s future with bookingkit! Thanks to the “booking-analysis” feature, you’ll know how many participants to expect for each date and offer. With our globally unique algorithm – capable of automatically evaluating both real-time and past data – you can modify your offers and give last-minute discounts or even increase participation through a marketing partner. This way, you can increase your revenue with almost no effort at all. 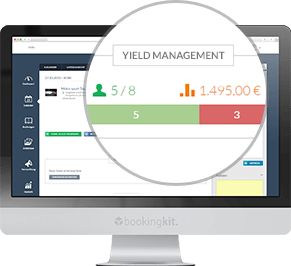 As the first and only worldwide booking-system for recreation providers, bookingkit offers you a feature that is used in the hotel and aviation sectors – “Yield Management”. bookingkit is excellent in many ways. Just find out for yourself! Try bookingkit now and enjoy all the benefits for free for 7 days, without commitment. Our experts will personally support you during the setup and thus, help you grow your business.